It’s becoming a routine Friday question for both me and JG – “Where are you hiking this weekend?” Because of the rain in the forecast, we had not planned to hike at all. But Saturday morning the sun came up, the rain forecast was moved to late afternoon, so what else could we do? We agreed that checking out a new section of the AT (Appalachian Trail) might be a good idea. So we drove to Pearisburg, parked the car and entered the woods. Right away we discovered the George Pearis Cemetery. I’m not usually taken with cemeteries, but this one was fascinating. Along with the Revolutionary War graves, there are also 4 Confederate soldiers buried here. The cemetery was within the first 10th of a mile into the hike and we decided if we were going to get in a good walk before the rain, we needed to move on. But first, I needed to get a shot of this tree. I thought it gave the cemetery a rather spooky feel as it seemed to be keeping watch over the graves. Shortly after returning to the AT, you must cross the New River on US 460 before coming to an underpass that takes you to the other side of the road. The next entry to the woods begins here. After the short rise from the road, the trail became a very easy walk for a couple of miles before descending into a creek bed. It’s probably the last weekend for the fall colors, and many trees are already bare, but we did manage to capture some of what is left. As we got back to the bridge, the clouds were really rolling in and there were a few sprinkles in the air. Good sense would say it was time to call it a day, but JG had other plans. We had about a .5 mile connector road from where we were to the entrance to Angel’s Rest and he does not like to leave that kind of a gap. So, with a little convincing, he persuaded me to soldier on. Of course after all the easy hiking, that last mile turned out to be quite a challenge, albeit beautiful. Returning to the car required rain jackets, but we did not get too wet and we were happy to be back home when the rain really let loose. A year ago my hiking was limited by damaged body parts. What a difference a year make, and how happy am I that I’m back out in the woods where I belong. It’s fun to see this hike from fresh eyes, enjoy LB’s blog and learn more about this fun day. Thank goodness for friends who encourage you to add fun to the calendar, and Karen, from The Unassuming Hiker makes sure that we do. 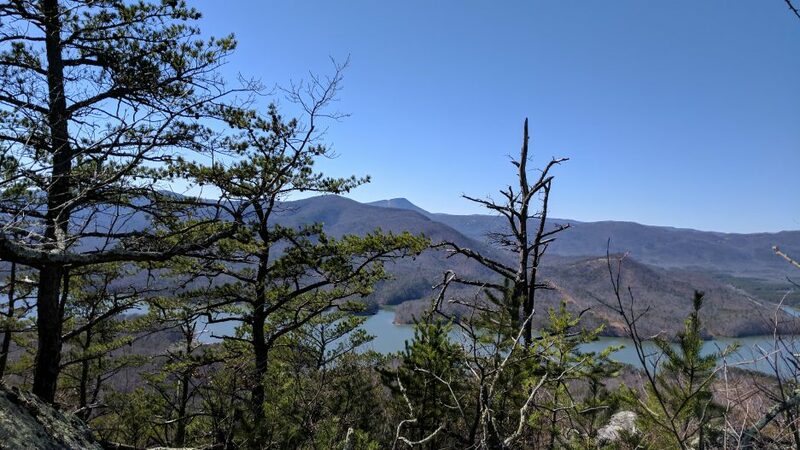 A couple years ago, Karen started a hiking club for women of all ages and hiking abilities, and while the group often ventures out during the week, Karen makes sure to plan a weekend hike several times yearly for those not retired. In addition, she schedules the date for those hikes several weeks in advance so that we make sure to set aside the time. “Buffalo Mountain is one of the most significant natural areas in Virginia. The combination of high-elevation (3,971 feet), wind-exposed openings at the summit, and magnesium rich soils make it unlike any place else in the Commonwealth”. Exactly a year ago today, I was joined by my weekend hikers on a strenuous hike of about 9 miles, in 43 degree weather, with 20 mile an hour winds. Bundled with stocking caps, gloves, and layers of clothes, we ended up having a great time. Yesterday, this same group of women joined me on a 2 mile, easy uphill hike in 60 degree sunshine! What a contrast! I’ve been to Buffalo Mountain many times, but on this trip we met a gentleman who has been doing this hike since he was a kid. He was able to point out all the area landmarks so that, for the first time, the geography of what we were viewing, seemed clear. We looked out from this mountain and were able to spot the Peaks of Otter where we had hiked a year ago. We love being on top of a mountain, no matter how difficult or easy the hike may be. That is the one constant! Thank you ladies, you make me proud! When my mother turned 50, I thought she was old. But she surprised us all by taking swim lessons at the local “Y.” Her and my dad frequently went fishing, and he was afraid that if she fell in the river, she would not be able to save herself. So she took swim lessons – at 50. It impressed me. My hiking buddies impress me too. These two ladies will jump at every opportunity to go hiking. They are both in their early 70’s. After a long hiatus, mostly due to my busy schedule and the weather, we finally got to go out on this beautiful fall day and hike to Bald Knob at Mountain Lake. The trail up is short but very steep. We go slow, we rest, but they always make it to the top and are so thrilled when we get there. We celebrate by making crazy poses. These two are fearless and fierce. So what’s in a number? It doesn’t seem to matter, as long as you stay active and young at heart. This blog is dedicated to my hiking youngsters – Peggy Sue and Joanne! This weekend we rented a cabin at Bluestone State Park in West Virginia. Having been charmed by the little town of Hinton nearby, we decided to give the area a try. We were not disappointed. The first day we hiked at the state park which proved to be quite an adventure. This time of year can be challenging due to the leaves covering the trail (which may hide things like rocks and tree roots). But after stumbling a few times, you learn to pick up your feet. We took the Rhododendron Trail to the Lake Trail crossing a rather dry creek bed. we had two options. We could walk up the road and catch the Lake Trail, or we could try a short cut that involved climbing up a steep, slippery hill. Guess which one we chose? You can’t fully appreciate how steep this was. But JG went first to see if it was “doable.” He barely made it to the top after sliding and banging up his legs a little. He told me he was NOT coming back down that hill, but he was also worried that I couldn’t make it up. His suggestion was that I take the road and we meet somewhere on the Lake Trail. I quickly nixed that idea and gave it my best shot. The advantage of not going first, is that the lead person has time to scout alternate routes from up above, which we found, just a few steps down from where this was shot. With the help of a tree, and JG’s hiking stick, we managed to get me on top of the hill. By the time we returned to our cabin, we were happily exhausted from the 4 mile adventure. The next day we decided to go toward the New River Gorge and see if we could find a good hike. We stopped at the Sandstone Visitor Center located at the southern entrance to the Gorge. What an amazing facility! It’s sustainable (green) design concepts for energy efficiency, also features a floor map of the New River watershed. The Park Ranger on duty directed us to a hike featuring two of the best vistas available, starting at Grandview (appropriately named). The 3 mile round trip starts out as an easy hike, but just before you get to the end there are some steep ups and downs and a number of steps. Of course you can also drive to both of them, so there were quite a few people at the lookouts, but hardly anyone on the trail. Back at the park, we kept running into this little guy who was nice enough to pose for me. Sunday, as we were leaving the park, we decided to drive around Pipestem Resort which was only 7 miles up the road. We had stayed at Pipestem many years ago, so we just wanted to check it out again. We arrived as the fog was layered across the canyon. All in all, an excellent weekend getaway! Tucked away in Rockbridge County Virginia, is a little gem known as Devil’s Marbleyard. That little spot in the middle that looks white – is the marble yard. and we had to park on the street. We had a rather grand entrance to this trail and the path starts out very pleasant. A gradual incline makes you think, this is going to be a piece of cake! Ha, too soon. Once you get next to the marble yard, the trail turns rocky and steep. If you are into “bouldering,” this hike is your dream. The trail stays like this for about 1/10 of a mile – but miles are not equal. By the time you finish this section, you will swear is was much longer. As we were halfway to the top, we ran into a colleague of JG. He and his wife were celebrating their 29th anniversary. Younger and faster than us, we let them go ahead, but we kept meeting up with them throughout the day which was nice. Once we got to the top of the mountain, we thought there would be a view of the marble yard, but we had been misinformed. They only view is from the yard itself. No problem, we took a connector trail and headed for the AT. Even though this added miles to the hike, it was worth it. This trail was a little easier and much more serene, we only ran into one other person. even though the trees did not allow a clear view. After a while, the trail leveled off and we could easily stop for snacks. I must admit, the trip down almost did me in. Imagine you have hiked six miles and the last part of your hike down includes the rock hazards. The “devil” part of the name becomes crystal clear. To top it off, you discover that the only good view you will get is if you climb onto the marble yard. Okay, it was worth it. Of course, if you are young, you can just skip on the rocks like it’s nothing. Leaving this area, it was still 2 miles to the parking lot. What I remembered as fairly easy going up, turned out to be rockier than I remembered and I thought at one point I could not go on. JG, being my true rock, gave me the encouragement and support I need to make it back to the car. He mentioned later that maybe we bit off a little more than we could chew. Before we left her home, my friend gave me a chocolate bar from Germany . She said “This will be your reward!” Thanks, Jaime, it’s just what we needed after a hike that lasted six and a half hours, going nine and a half miles. I slept eleven hours last night. This morning my husband decided my trail name should be “Trooper.” Thoughts?